After a whole lot of planning (which I still felt was not enough, but I didn't have time or much help) the day finally arrived: Osaka-Kyoto-Sapporo-Tokyo roadtrip commence! :D Our flight to Kansai International Airport, Osaka, was at 3 pm so we decided to leave the house at around 11.45. I thought that was ample time buuuuut we must've missed a turn somewhere and I had never taken the NKVE to LCCT before. In the end we arrived just in time to drop off our baggage and clear the security check. Thank God we checked in online earlier hehe. Our flight arrived at around 10.30pm local time, which was a bit late to catch the last trains into the city. Also, being the cheapskates that we are, we didn't feel like paying for a bed just for one night, so we decided to sleep in the airport and get the earliest trains to Kyoto the next morning. Our flight landed in terminal 1 of KIX, which is the main terminal. It seemed pretty small but functional, which I suppose, is what Japan is all about. 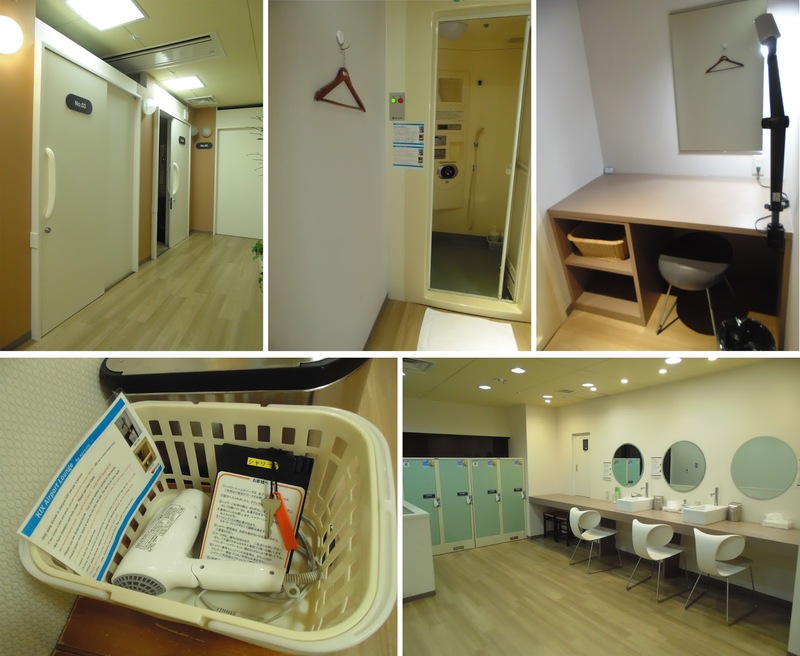 After reading up about sleeping in KIX from this website (backpackers best friend, this) I followed the reviews advice lead my sister to the 2nd floor next to Lawson. It was a pretty quiet and secluded area but completely safe and well lit, but not as bright as the rest of the airport, which was great. The airport has free wifi (another backpackers best friend) so I checked foursquare for any tips and found out you can borrow blankets from the airport information centre which was right next to where we were going to sleep. Perfect! the blankets were nice and thick, and blocked out light excellently. We slept like babies. The next morning we woke up and headed for the coin operated showers in the airport lounge nearby. A shower was ¥500 per person (approx. RM15) and you get a changing room, shower cubicle, hairdryer and small basket to yourself. Soap and shampoo are provided as well. Once you start showering you are given 15 minutes of running water. Plenty of time for the most expensive shower I've ever taken. the KIX lounge shower facilities. Jakun ok! All freshened up we headed to the Kansai airport train station to get our tickets to Kyoto. While planning for the trip, Hyperdia came in extremely handy in working out which trains I could take and how much/how long it would take. Printed out the relevant results and lugged them everywhere hehe. But as useful as it was to know which train to take and how much it would cost, we were still stumped when faced with the ticketing machine. Spent quite a few minutes prodding the screen trying to pick our destination before asking someone for help. As it turns out, you don't choose your destination on the screen, but rather, on the huge board showing destinations and how much they would cost. then at the machine you insert that amount of money, and a ticket will be issued. Quite confusing at first but towards the end of the trip we got the hang of it, kinda. The printed out sheets also helped a LOT. me and my trusty file o'stuff. The train to Kyoto took about 1.5 hours on the direct express train. Once in Kyoto, we got ourselves the day passes for the local bus (¥500) and headed to our hostel. 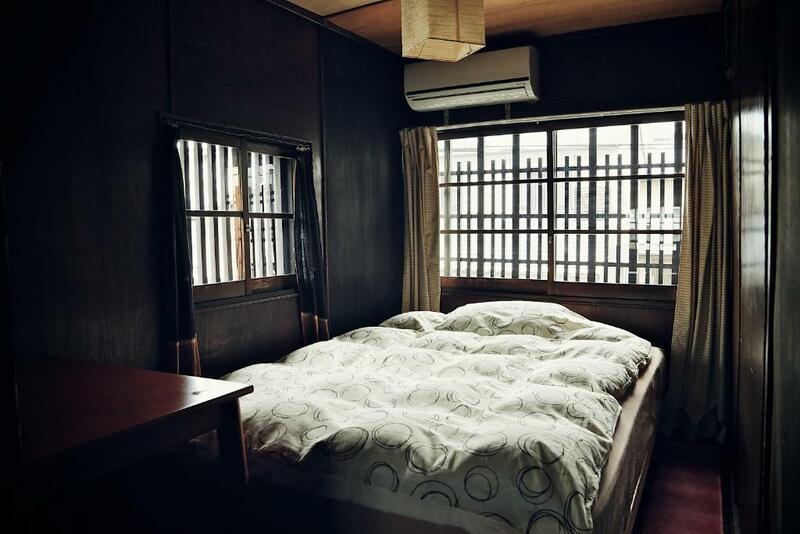 We stayed at Hostel Mundo, as suggested by Afi, since it was the cheapest we could find, and as an added bonus, it was in a traditional house:D The tatami room was taken though, so we had to settle for the double bed room, which was very comfortable if a little tight. The room we stayed in. Cosy! After dropping off our bags there we started our sightseeing. First stop was Kitano Tenmangu, which hosted a flea market every 25th of the month, so we couldn't miss that. 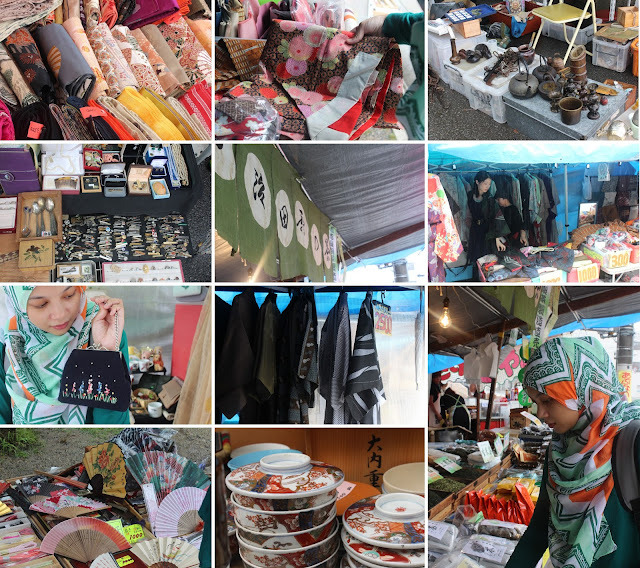 There were so many interesting things on sale, pottery-ware, food, knick-knacks, and second hand kimonos, which were quite cheap! 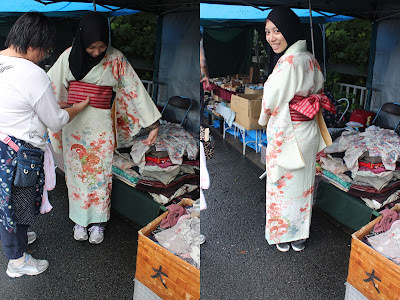 Munira bought a silk autumn kimono and obi for ¥2000 (~RM65) which was a steal. Next we walked towards Ryoan-ji, the Zen temple, and on the way stopped by the Kyoto Prefectural Insho-Domoto Museum of Fine Arts because it was free and air conditioned :p Ryoan-ji was surrounded by beautiful greenery, very peaceful. The Rock garden itself was a bit small and I was more interested in the building and surroundings honestly. At the entrance we were given some seaweed tea, which I thought would be like green tea but oh boy was I wrong! it was extremely hot and salty, kind of like drinking boiled seawater. but the after-taste was quite good, and you definitely feel refreshed after a few sips. Just not my cuppa tea though, literally. Japanese forests are scary, dark places. beautiful, but so so dark, even right at the edge like here. The sun was setting but we had some time so we decided to go to the Philosophers Path on the other side of the city. Had we made it there earlier, we could've visited Kinkakuji's sibling, the Silver Pavilion Ginkakuji. But as it was we reached there around 6, which is when it closed for admission. So we strolled down the Philosophers Path instead, which is a 2km long path along the old Kyoto canal. In the spring the cherry blossoms lining the path make it a very popular cherry blossom watching spot. Me and Munira tried to be all philosophical...but most of our made up sayings (which honestly consisted mostly of streams, fish, paths, lights, and life) were either funny or didn't make sense haha! "in life, it is not the path you choose, but the direction you take that matters"
"stream over a stream, is like a dream, over a dream"
At the end of the path we found ourselves slightly lost, but managed to find a bus stop and hopped on to get to Nishiki Market, Kyoto's Kitchen, for some dinner. We got there, but it was quite late and most shops in that street had closed. we ended up walking through the arcades along Shijo-dori instead, gawking and ogling all the interesting shops. At the end of the arcade, still hungry, we came across a shop selling udon for quite a reasonable price, so we popped in not expecting much. But it turned out to be suuuper delicious! A small bowl of udon, which was topped with chopped spring onion, salmon roe, half boiled egg, seaweed, and prawn tempura cost ¥500, which is about as cheap as meals in touristy areas get. A loooooong walk and short bus ride later, we got back to our hostel for some much needed rest and planning for the next day.